Chief Bazrag is the chieftain of Clan Fharun, and rules from Fharun Stronghold. He opposes the rule of King Kurog and the religion of Trinimac. Once, he was a member of Gaspard's Stalkers, a mercenary group. Chief Bazrag : "Where did you take our supplies?" Chief Bazrag : "I'll kill a Winterborn every second until you tell me what I want to know!" Chief Bazrag : "The clan peasants? Are they on their way to Orsinium?" Ulsha : "The soldiers escorted them and the wounded outsiders. They should be safe enough." Chief Bazrag : "Safe enough isn't good enough. Go after them. I'll continue to look for the Winterborn and the missing supplies." "You're the outsider who leaped into the bear's den to fight the Winterborn? Ulsha and the Wood Elf mentioned you. Surprised you didn't end up all bruised and bloody like the rest of these fools. This is our home, not an amusement for your pleasure!" "And I appreciate that. Doesn't change the fact that I despise that you're here, though, sticking your nose in our business." "Ah, yes, the king's invitation. And what a royal bag of snakes that is! Look, you have my thanks for saving those people. And, as much as I hate it, I owe you a favor. But right now I need to determine where they took the stolen supplies." Maybe this note will help you find the supplies. We've been betrayed! And for gold, no less! By Malacath, I'll make sure someone pays for this. Look, I need to protect the next caravan to come through the Merchant's Gate. If you truly want to help Wrothgar, then you will help me." "This note indicates that the traitor has interests in the city. I want you to track down this traitor and find our stolen shipments. The fastest way to get on my good side—and on Kurog's—is to expose the traitor and recover our supplies." I'll go to Orsinium and see what I can learn. "I suggest you start your search in the inn. Gold and dark dealings often go hand in hand with drinking and celebrating. Don't disappoint me. I hate putting my trust in outsiders. Do everyone a favor and prove me wrong." What are you the chief of? "I'm the chief of the Fharun clan, one of the oldest and strongest clans in all of Wrothgar. Kurog makes it sound like tradition is a bad thing, but by Malacath's broken tooth, tradition is the lifeblood of Orc culture. It's who we are!" That's why you're giving me so much grief? "You're a long way from home and sticking your nose where it doesn't belong. That's a good way to get it cut off, at least in my stronghold. Still, Malacath would call me a fool if I turned down help when it was freely offered." Why would someone betray the Orc clans? "Unfortunately, not even Orcs are immune to greed. War provides too many opportunities for those willing to trade in lives and suffering. Gold! It turns brother against brother. We were better off when we bartered for everything we needed." What should I look for in the city? "Look for anything that would link this traitor to the note you found. Someone with a lot of gold to spend would be a good start. Then there are the Khajiiti traders that were mentioned. How many of the cat-people could there be in Orsinium?" "Your courage and resilience in the face of adversity do you honor, my friend. If not for you, the clan chiefs and I wouldn't be standing here. And I certainly wouldn't be king. Hmm, so this is all your fault, isn't it? Don't you enjoy being king? 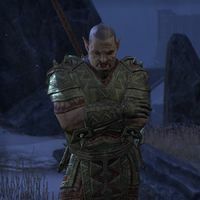 You have a place here with the people of Orsinium, but as much as I'd like you to stay, I know there are others out there who need your help." What if I don't want to go? This page was last modified on 11 November 2018, at 23:52.